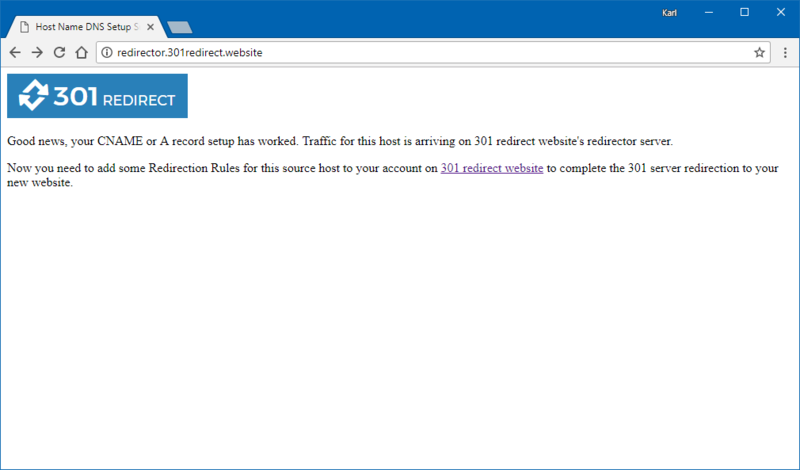 Here is a step-by-step guide to using 301 redirect website to create the 301 redirect map you need to redirect all pages from an old site to new pages on a new site, or split the traffic onto different sites. You need to get traffic that you want to redirect hitting my server so it can perform the redirection. This can be done by setting the host name in the DNS control panel of your domain name. You need to set the CNAME to redirector.301redirect.website or the A record to 217.194.214.246. Note it is much better to use the CNAME option: read here for more info. Once you have made the DNS change; when you load your website into the browser you should see this page shown in the image below. Create an account and login. Make sure you have verified your email address. Click Add new redirect.. and then fill in the details requested. You can upload an XML sitemap (recommend this), but you can also choose to let actual received traffic populate your Results Table and use this to help create your redirect map. You can always add an XML sitemap later. This is the destination website where you want the traffic to be redirected to. You can change this later, and you can also specify different destination hosts per page or per Rule. You write Rule that are processed in order. This is your Redirect Map. Specify the original file in the Rule column and the destination host and file in the Destination column. Where 301 Redirect Website really comes into its own is in that you can use the wildcard asterisk * to create a 'Smart map' and automatically replace part of a url folder structure to the new site's structure. And it will also match /destinations/botswana/index.php to https://redplanet.travel/mdtravelhealth/destinations/botswana and so on. Ready to sign up for the free service? Please go ahead and create your account.